The workers are not allowed to bring in their dogs, and they don’t curl up in beanbag chairs. But they are encouraged to collaborate with one another and with the city’s wider business community. Mr. Hinrichs works to nurture connections among the small businesses — software developers, public-relations consultants and sustainable-agriculture advocates — that work in his space, and he says such cooperation is helping the local economy. Like other operators of so-called boutique co-working spaces in smaller cities, Mr. Hinrichs is also seeking to distinguish his business, Fuse Coworking, from the big players like WeWork and Regus. The fast-expanding co-working movement is transforming the workplace and attracting investors. The Japanese telecom conglomerate SoftBank recently increased its stake in WeWork to about $10.5 billion, valuing it at $47 billion. Some larger competitors strive to create a freewheeling atmosphere by allowing pets and skateboards in their work spaces and offering Ping-Pong tables and juice bars. But Mr. Hinrichs said his members felt a sense of belonging in a distinctively local building and benefited from regular contact with business leaders in the community. “You have access in Lincoln to people and getting things done, and a sort of can-do, barn-raising mentality,” he said. Mr. Hinrichs returned to his native Lincoln seven years ago after living in the Bay Area, where he became interested in the co-working concept. “The co-working space came out of that,” he said. 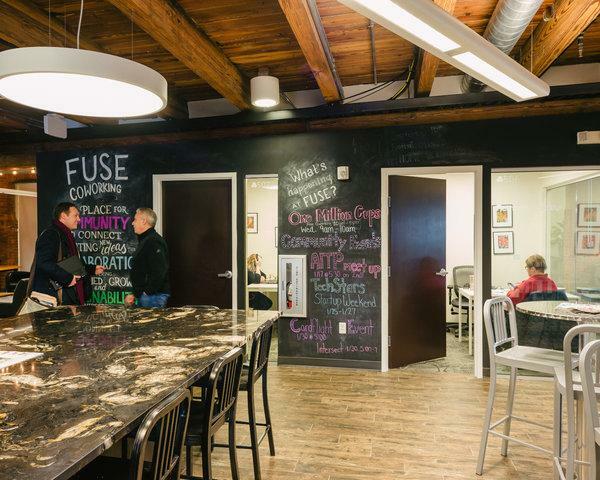 Since opening, Fuse Coworking has expanded to about 40,000 square feet from 2,500 square feet. Its services range from drop-in desks for the occasional worker for $50 a month to “dedicated desks” plus 20 hours of meeting-room space for $300 a month. The space, the first of its kind in Lincoln, is used by about 55 companies that employ anywhere from one to 35 people. It has been embraced by the city’s business community, which sees it as an important incubator and contributor to the local economy, Mr. Hinrichs said. In Pittsburgh, the Detective Building, which once housed the Police Department’s homicide division, is the latest location for Beauty Shoppe, a commercial real estate developer that creates co-working spaces intended to have local appeal. It’s the seventh space opened in Pittsburgh by Beauty Shoppe, which seeks buildings in neighborhoods that it views as underserved by co-working space. The company also has a space in Cleveland, and it just started construction on one in Detroit. It has plans for more in Portland, Me. ; Providence, R.I.; and Columbus, Ohio. “They are in places that are underdiscovered but have a bit of soul and character and we see an undersupply of quality co-working,” said Matthew Ciccone, one of the company’s founders. With its modular sofas, coffee tables and high ceilings, the new space is meant to be a comfortable and productive place for businesses that include not only the tech start-ups that might be expected, but also people like accountants, lawyers, graphic designers and architects. Mr. Ciccone said small businesses were better served in boutique co-working spaces than in national chains like WeWork, and would benefit from more amenities than in conventional office space. “If you are a four-person graphic design company, your options are usually substandard Class B office space with an old-school stodgy landlord that just doesn’t provide a lot of services for you and your employees,” he said. Mr. Ciccone’s clients include Courtney Watts, an employee of the I.T. consultant Infosys in Chicago, who moved back to her native Pittsburgh a year ago after about a dozen years away. She signed up with Beauty Shoppe with the aim of reconnecting with the city. Benjamin Schmidt, chief technology officer for RoadBotics, a two-year-old technology company, said he and his fellow founders had chosen to rent space in the Pittsburgh Detective Building because its individual design, with exposed steel beams, was more attractive than the “office vibe” at some other co-working spaces they had looked at. He said any co-working space made more sense for his staff, about 30 full- and part-time employees, than a conventional office building because of the lower costs and greater amenities. WeWork declined to comment on the boutique market. But a spokeswoman for the company, Annie Lohmeyer, said it did not operate in some smaller cities. Despite the efforts of boutique co-working spaces to differentiate themselves from bigger competitors, it’s not clear whether they will be able to maintain their edge while growing, said Kevin Michals, managing partner at Cross Properties, a building owner and developer in Philadelphia. He predicted that co-working spaces would become standardized as they consolidated, as big corporate clients increasingly demanded a consistent product across multiple locations and as venture capitalists investing in co-working providers sought returns. “If I’m I.B.M., I don’t want to sign a hundred different contracts in six different cities,” said Mr. Michals, whose company is refurbishing a 50,000-square-foot building for Regus in downtown Philadelphia. But some boutique owners remain convinced that small is beautiful, and they have no plans to homogenize their spaces. Nick Petroski, one of the founders of OSC Tech Lab, a 45-member co-working space in an old railroad building in Akron, Ohio, said smaller locations had the best chance of competing with the big players by creating a personalized atmosphere.